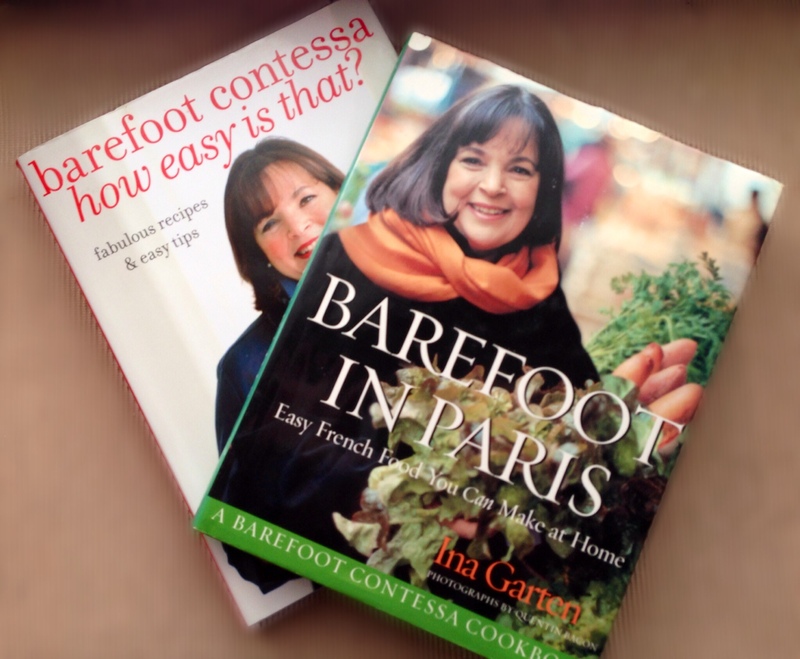 You can’t go wrong with anything in the Barefoot Contessa collection; delicious recipes, beautiful photos, and informative chapter introductions, Ina Garten has nailed the formula for an exceptional, easy to use cookbook. I have everything she’s written, but these two are my favorites. Foie Gras with Roasted Apples – How Easy is That? 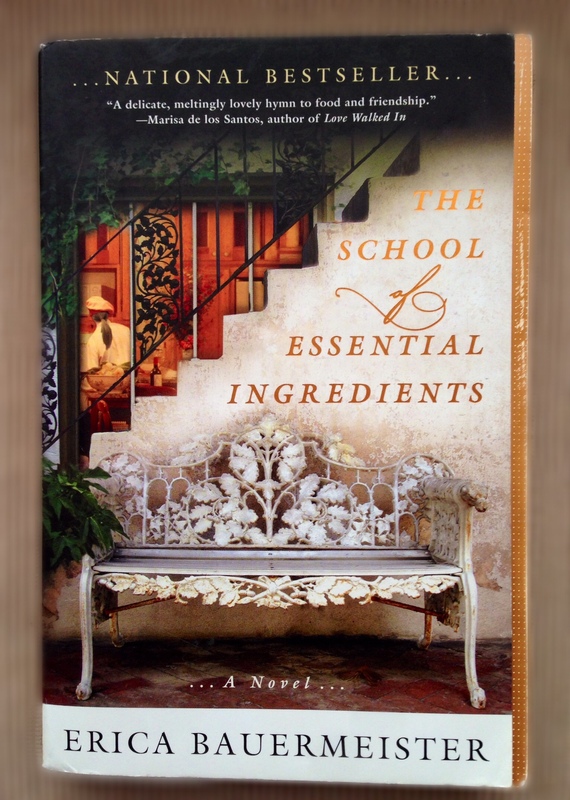 Not cookbooks, per say, but other books (memoirs, novels, short essays) centered around the joys of cooking and eating. In a crockpot, combine all ingredients up to the ham hock. Stir well, then nestle ham hock into the middle of mixture. Cover and cook on LOW heat for 8 hours or HIGH heat for 4-6 hours. Find bay leaves and discard. Gently remove ham hock and set aside. Once cool, cut meat away from bone, dice, and mix into beans. 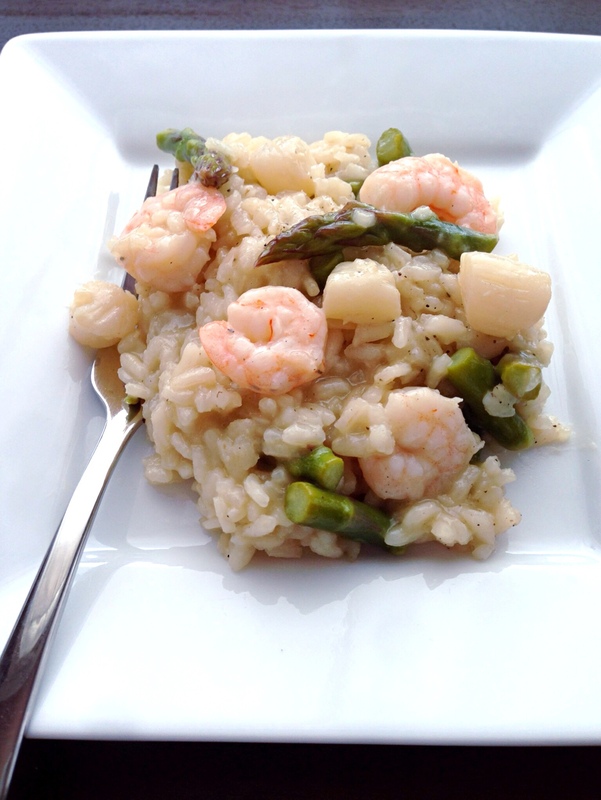 Season with salt and pepper, then spoon over top a bowl of cooked long-grain rice. 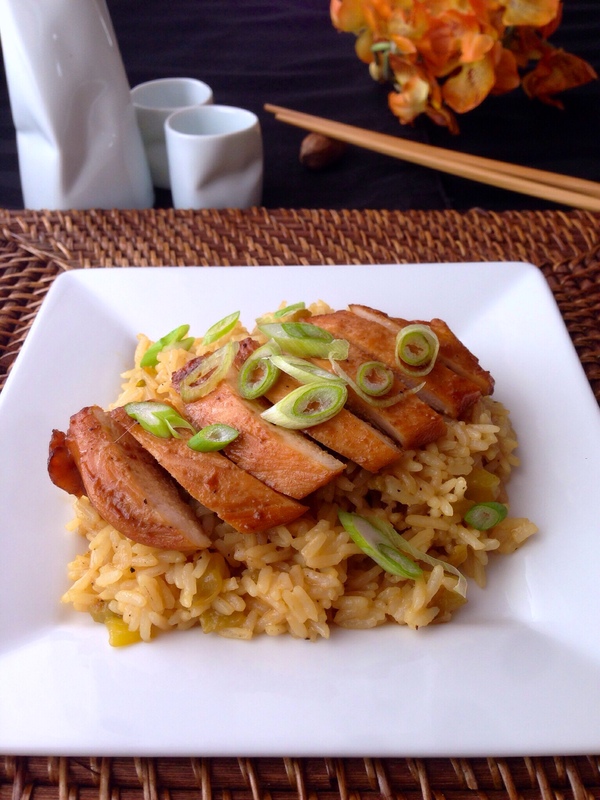 Top with sliced green onions. 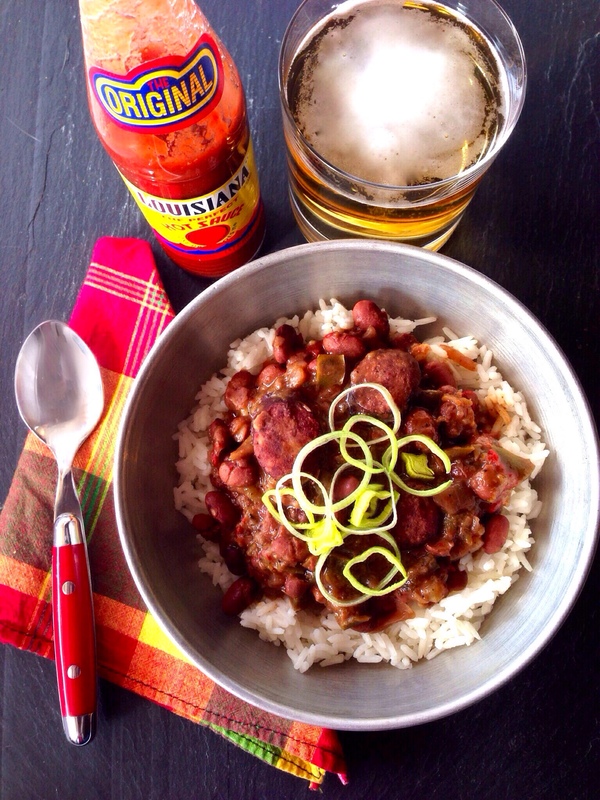 I like my red beans & rice SPICY! so I always have a bottle of Louisiana Hot Sauce on the table, that way I can add as much heat as I want. Because of the aforementioned spice, I need something cool to extinguish the fire, and beer does just the trick. Try something crisp and light like a Pale Ale or Lager. If you prefer wine over beer, uncork a bottle of Beaujolais, Shiraz, or Gewürztraminer instead. I wait to add the cayenne pepper and red-pepper flakes until after I dish my toddler’s serving. If you don’t like too much heat, omit one or both. Also, in that case, the spicy Andouille sausage can be replaced with a mild smoked sausage. Fresh ham hocks can be purchased at your local butcher, or prepackaged ones can be found in the meat section of most grocery stores with the spiral cut hams. The first time I saw a pair of these brightly colored gloves in action (outside of a medical office) was in my mom’s kitchen. She was standing over a cutting board, chopping onions, and telling me about the latest guest on Ellen. “What ARE you wearing?” I asked her in total dismay. “Gloves,” she answered as if it were the most natural thing in the world, “I hate the way onions make my hands smell.” Huh! As much as I love to cook, it had never dawned on me that there was an alternative to having hands that perpetually reeked of onions and garlic. That evening, I left with a pair of nitrile* gloves tucked in my purse, and now I’m never without at least one box stored in my kitchen. In the years that I’ve been donning this ridiculous-looking kitchen attire, I’ve found many other helpful uses than that of odor control. When I’m peeling roasted beets, I wear them to keep my hands from being stained red. I also wear them when I’m kneading dough so that I don’t have to spend 20 minutes scrubbing my fingernails and rings. Nitrile gloves are also great for handling hot foods; I use them when I’m making homemade stock and I need to strip the meat from the bone, or when I’m rolling hot tortillas into enchiladas. 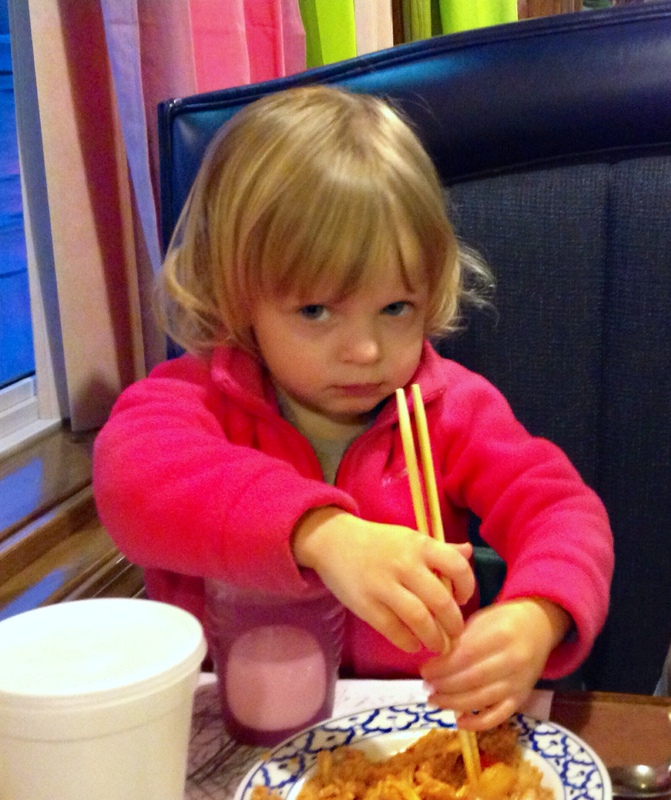 Now that I have a toddler, I wear gloves when I’m handling chicken, fish, and other raw meats. 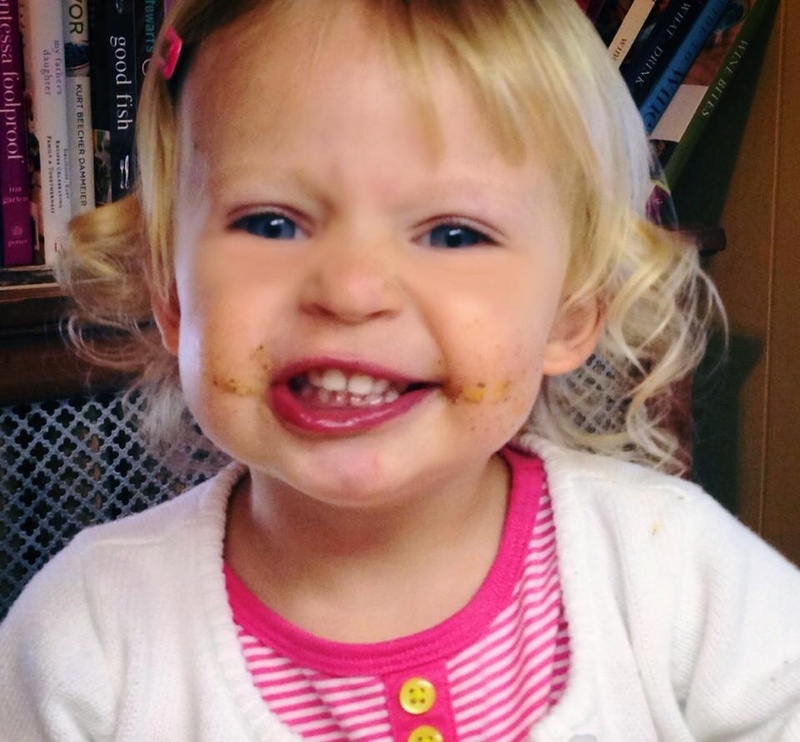 This way, when she takes a header off the couch (which happens on a weekly basis), I’m able to strip them off and attend to her tears without having to worry about scrubbing down or spreading any food-borne bacteria. And ladies, when you’re sporting a fresh manicure, these handy gloves prolong the life of your polish — and that alone is worth the price of the package! 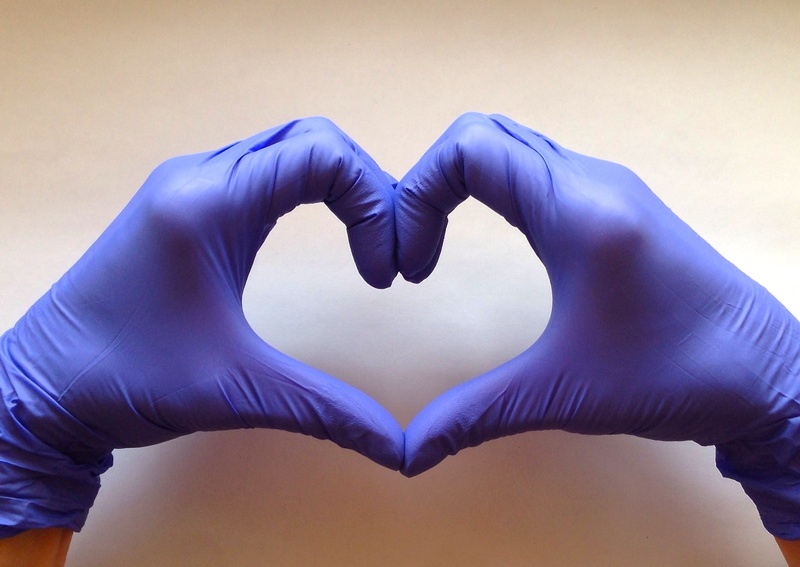 Nitrile gloves can be found online at Amazon.com. *Note: Nitrile is a synthetic rubber material used in place of latex. Latex allergies have been on the rise in recent years† and cause symptoms as mild as a skin rash, runny nose, and sneezing to as serious as anaphylactic shock. Many people don’t even realize that they are allergic to latex if they aren’t exposed to it on a regular basis. Even if you’re certain that you’re not allergic to latex, it’s best to play it safe and keep it out of your kitchen. Most latex gloves are powdered for easy application, and that powder can become airborne, irritating the lungs. Just like before, we based our review on taste, smell, nutritional value, availability, and price. 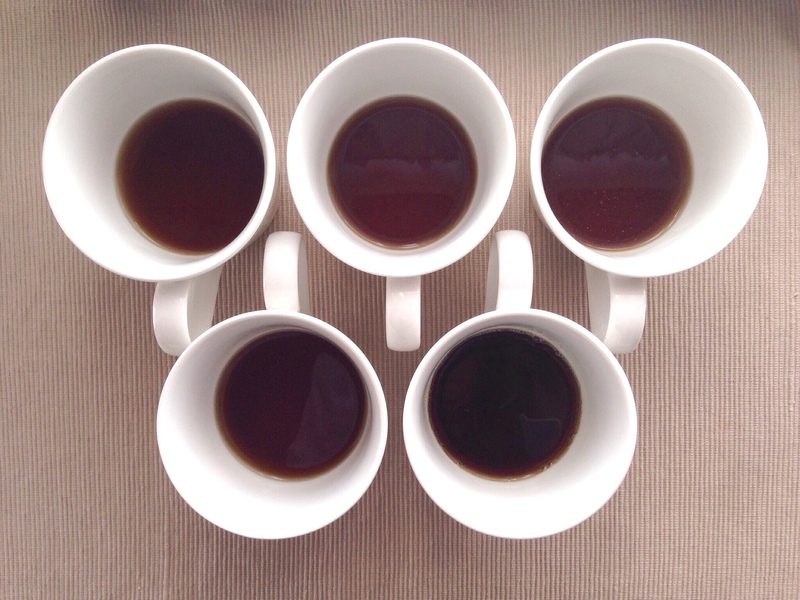 With our chicken stock review we also took into consideration the color, but as you can see from the photo above, all five varieties are brown. So brown, in fact, that we chose not to comment any further. Throughout our sampling, we discovered that store-bought beef stock often tastes like the vessel it’s packaged in. With the exception of two brands, we weren’t impressed. Below I’ve detailed our two “Recommended Stocks,” then lumped the other three into a “Meh, Not so Much!” category. College Inn (top middle): This brand is very easy to find, affordable ($0.79 for a 14.5 oz. ), and is the tastiest of the five stocks we sampled. It had a nice smell of roast beef, and although a bit salty, could almost stand on it’s own, much like an au jus. Sadly, the sodium count was higher than I like (990 mg per serving), but if you’re not worried about that, than College Inn is the stock for you. Kitchen Basics (bottom right): Also a very easy brand to find, but a bit pricier ($2.69/32 oz.). This stock was somewhat bland, with little to no aroma, which after tasting the other three, is just fine. When added to a dish with aromatics and veggies, this stock could provide a simple base in which to build upon. With only 430 mg sodium/serving, it’s a much healthier pick than College Inn. 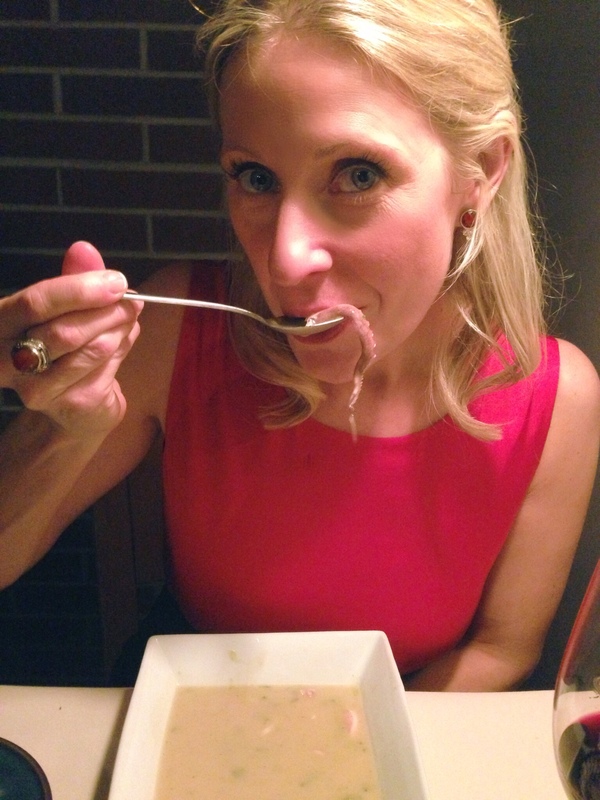 Next up…Vegetable broth and seafood stock. 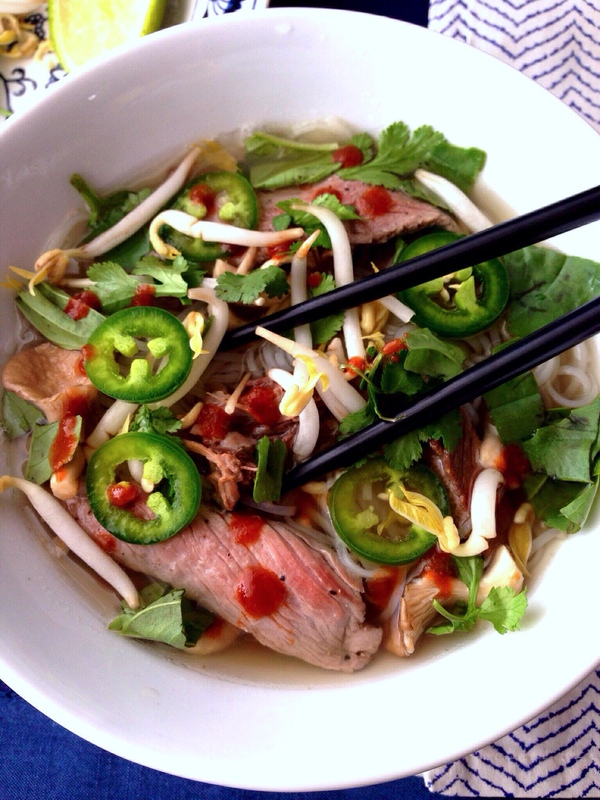 Beef phở (pronounced fuh) is a traditional Vietnamese soup (typically made with beef although chicken and vegetable versions are also available), wide rice noodles, and served with a variety of garnishes. 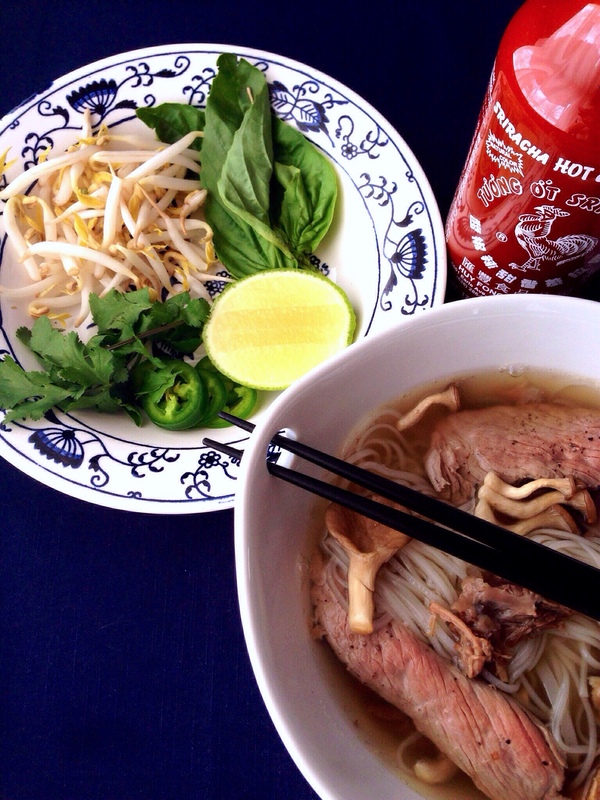 To me, there is nothing more comforting on a blustery winter day than sitting down to a steaming bowl of phở, slurping noodles off a pair of chopsticks, and feeling its warming effects spread to the ends of my fingers and the tips of my toes. The broth, steeped with spices and charred onions, is slightly sweet, highly flavorful, and wonderfully aromatic, which sets this soup apart from other “noodley” soups, as my toddler likes to call them. (If you don’t have time to make this somewhat labor intensive stock by hand, see the Shortcut at the end of the recipe for tips on how to quickly enhance store-bought stock.) Oh, and I promise next week’s soup will be an easy one. No really — chop a few ingredients, throw everything into a crockpot, then put your feet up and wait for the payoff! 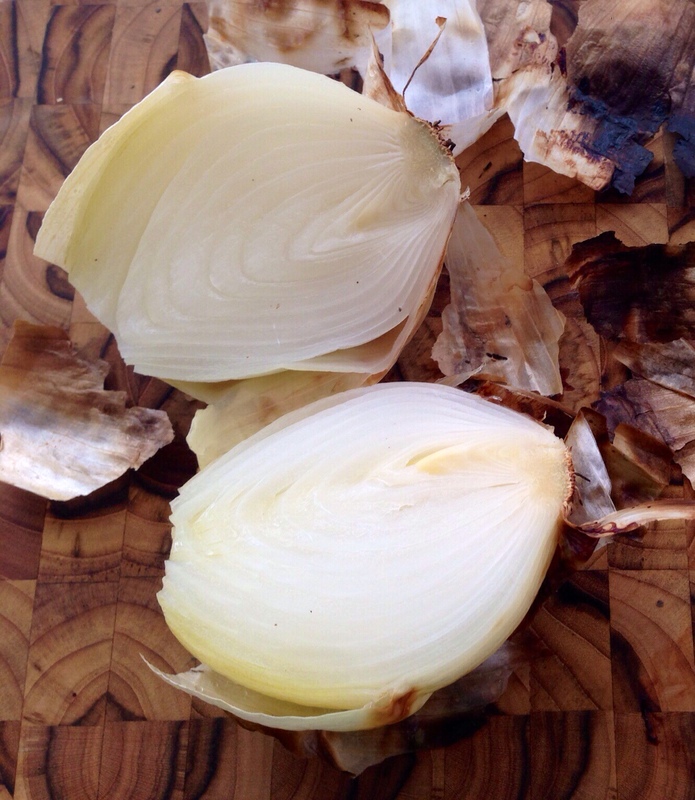 On an outdoor grill: Place onions and ginger over direct heat on high. Allow the skins to become black, then turn, continuing to char on all sides, 5-8 minutes. In an electric oven (pictured below): Turn oven on to broil. 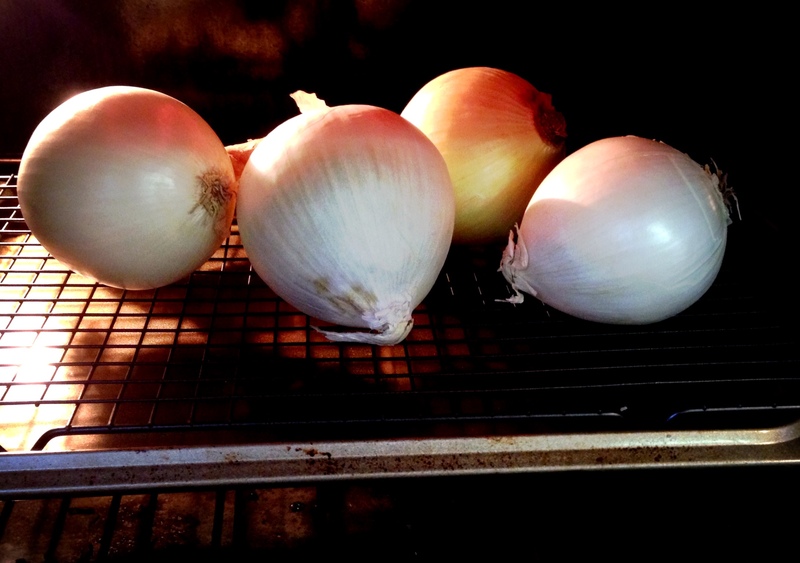 Place onions and ginger on a foil-lined roasting pan and place on an oven rack set 3-4 inches below the broiler element. Allow the skins to become black, then turn, continuing to char on all sides, about 20-25 minutes. 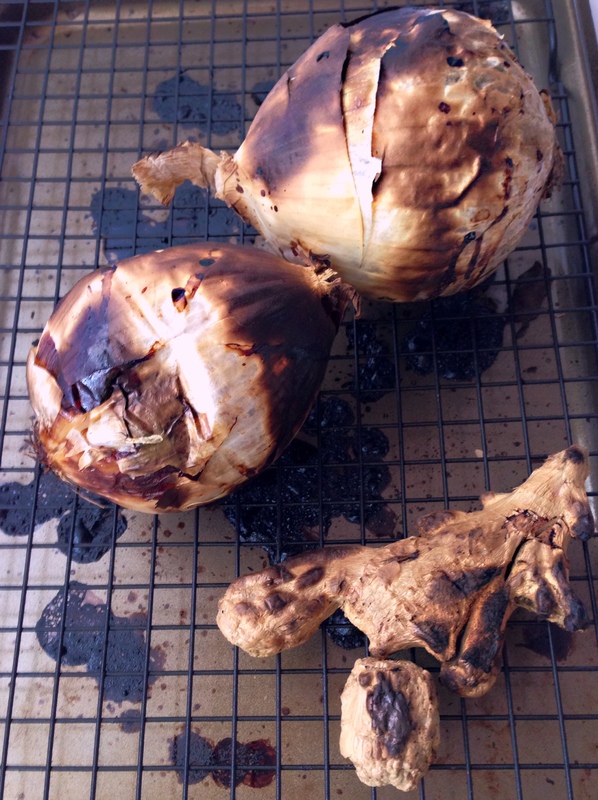 Peel onions and ginger, rinsing off any blackened bits. Cut into quarters and set aside. Add beef and bones to a large stock pot. Cover with water by 2-inches. Bring to a boil and continue to boil for 15 minutes. Dump water, beef, and bones into a colander set in the sink, allow to cool slightly. Rinse stockpot clean of any residue. Run cold water over beef & bones, and gently scrub any scum from the surface. This will eliminate cloudiness, leaving you with a crystal-clear broth. Beautiful! Once stock is done simmering, remove onions, ginger, and spices and discard. 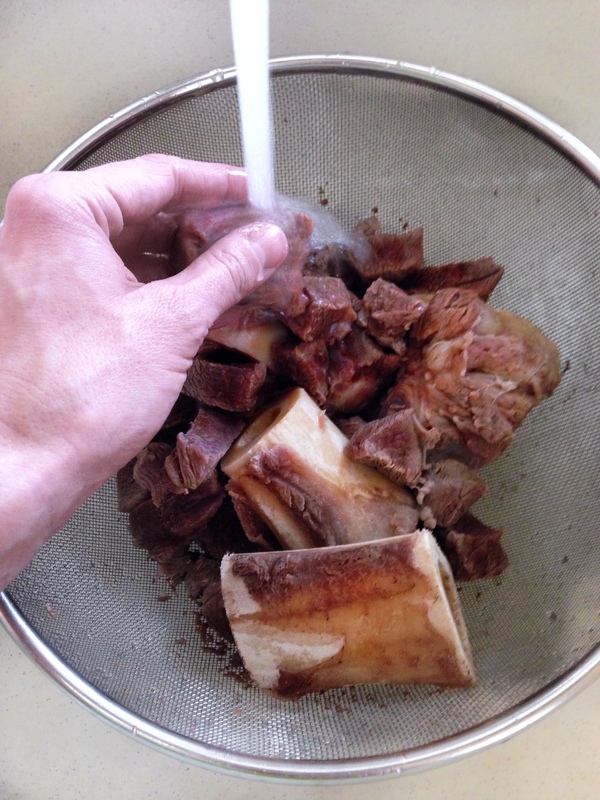 Gently scoop beef & bones from stock and set aside. Pour stock through a fine-mesh sieve set over a large storage container. Refrigerate, uncovered, overnight. 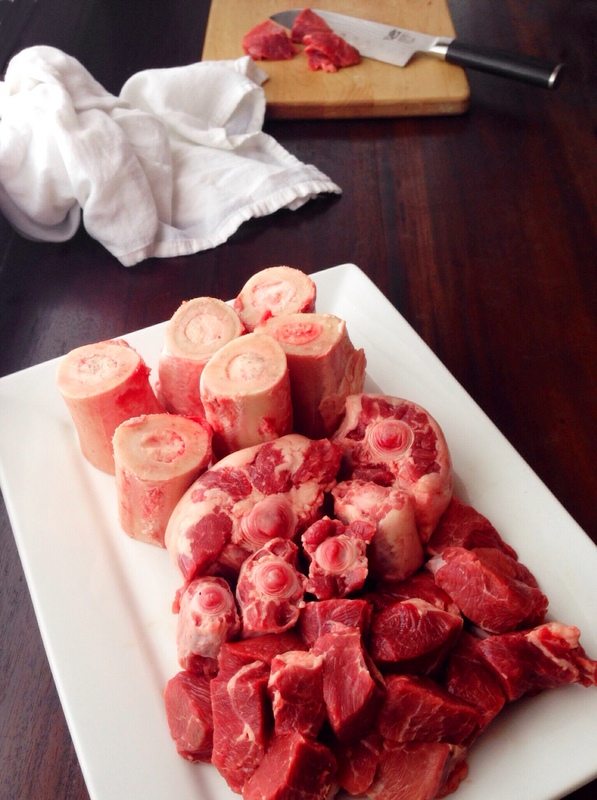 Carefully remove any meat and connective tissue from the bones and oxtail and place in a storage container, cover. Slice brisket and place in a separate storage container, cover. In a third storage container, add the beef chuck. Cover, and refrigerate all three. Discard bones. 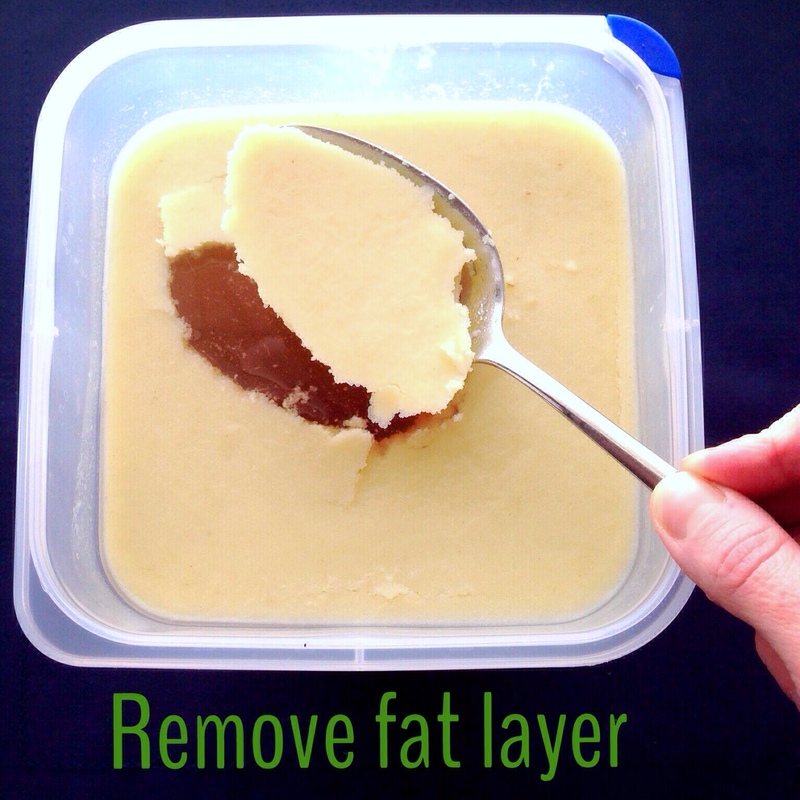 After the stock has cooled overnight, use a slotted spoon to gently remove the layer of fat that has risen to the top, discard. You may end up with more stock and beef than you need for 6 servings. Both stock and beef can be refrigerated separately for up to three days, or frozen for 4-5 months (see tips on freezing stock in Homemade Stocks). 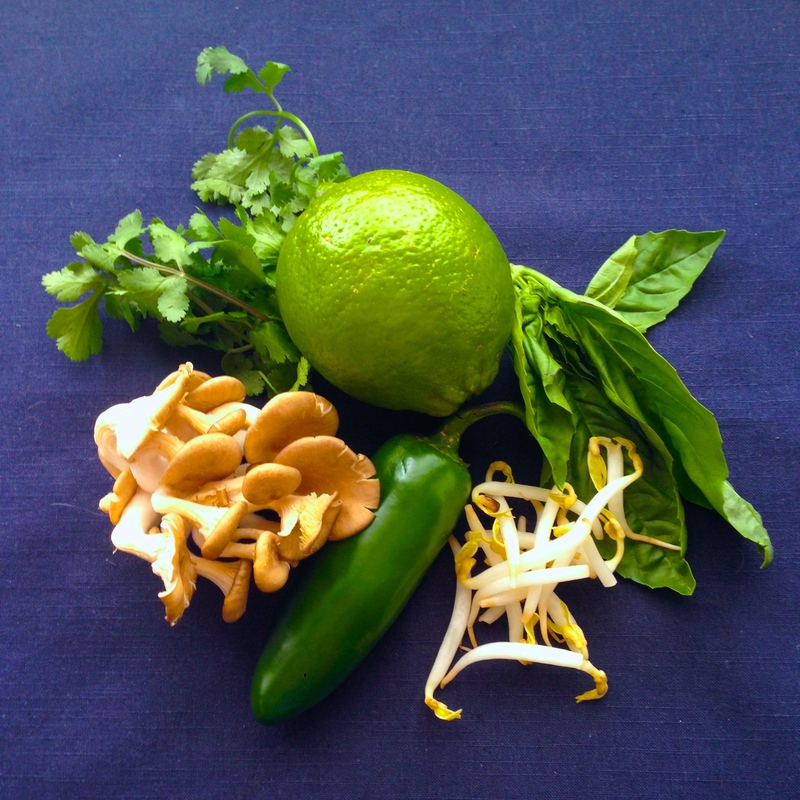 Evenly divide garnishes (bean sprouts, lime wedges, fresh herbs, green onions, and chiles) among 6 small plates. Microwave reserved beef until warm, and place in three separate serving bowls. In a large stock pot, bring stock to a simmer. Test for seasoning and add more fish sauce and salt & pepper if needed. Add mushrooms to stock and continue to simmer until soft, about 5-6 minutes. Add thinly sliced beef (rib eye, skirt, or flank steak) to stock and cook for 1 minute, until rare. Cook phở noodles per package instructions, strain and divide among 6 bowls. 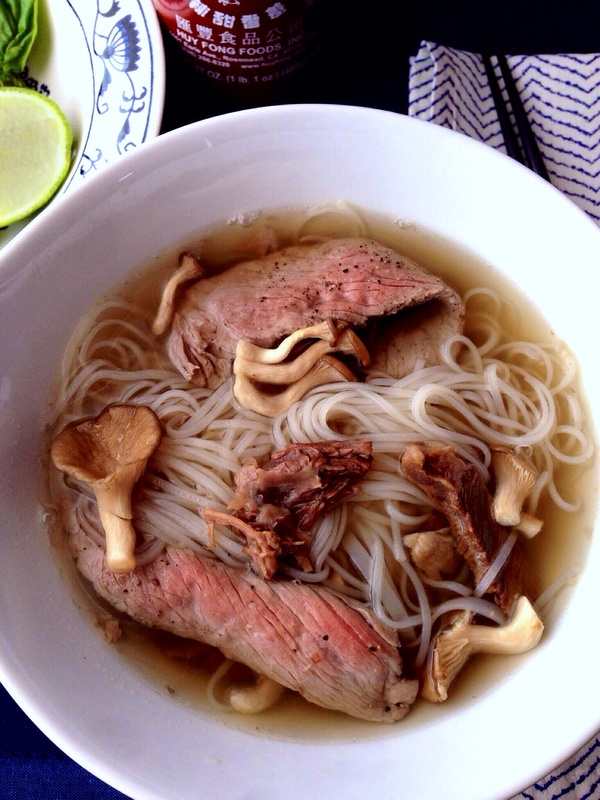 Ladle stock, thinly sliced beef, and mushrooms into bowls over top of phở noodles. Place serving bowls of reserved beef on the table, allowing guest to add what they like. 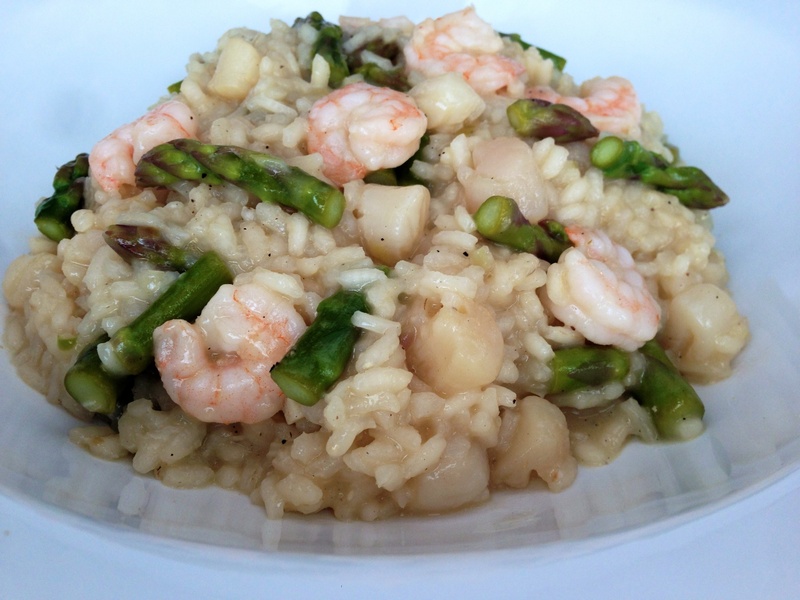 Serve with Sriracha, fish and/or hosin sauce, and a plate of garnish for each guest. Yellow rock sugar can be found in many Asian markets or online, however, you can always substitute Sugar in the Raw or regular granulated sugar. 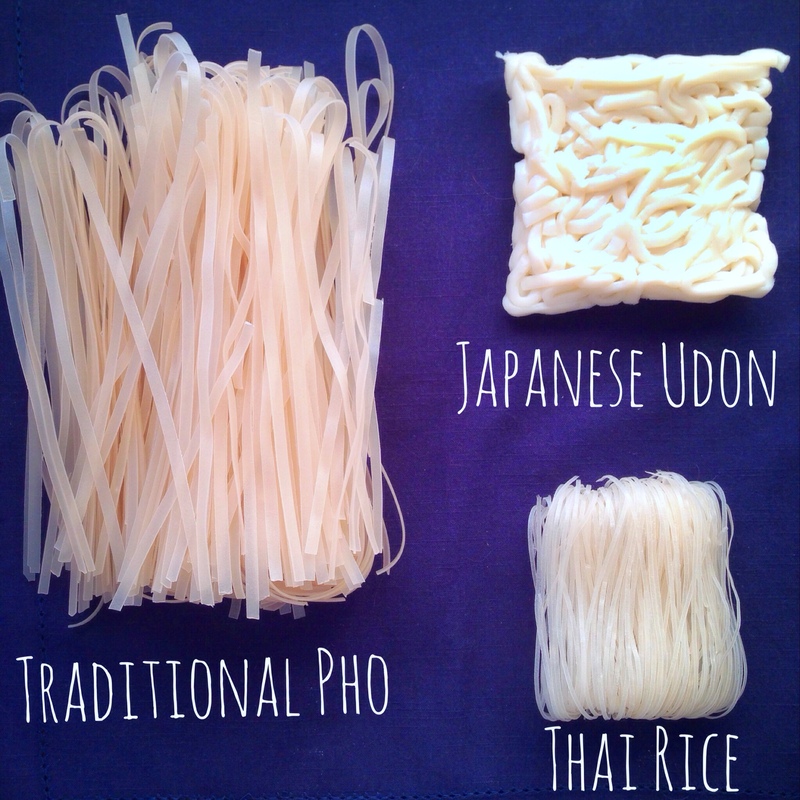 Phở noodles can also be found in many Asian markets, however, if they’re unavailable in your area, look for another style of Asian noodle (see examples pictured below). And if you’re really in a pinch, you can always use instant ramen noodles. Shortcut: In leu of making your own stock, add 12-16 cups of store-bought stock (about 2 cups per person) to a large stockpot. Add 1 cinnamon stick, 3 whole star anise, 2-inches peeled and sliced ginger root, 6 whole cloves, 2 tsp. coriander seeds, 1 tsp. fennel seeds, 1-2 tsp. sugar, 2-3 Tbsp. 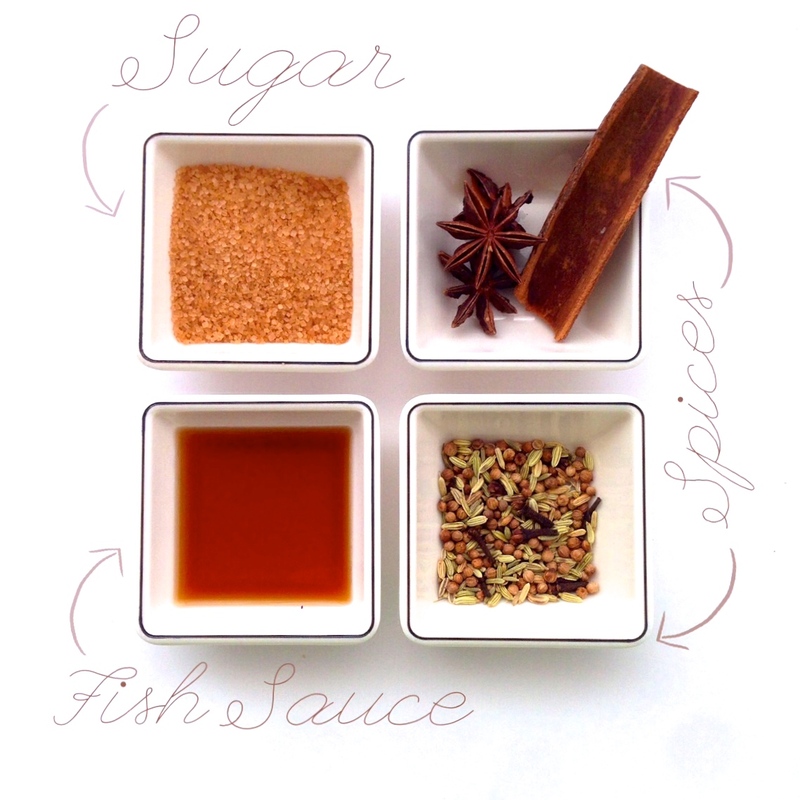 fish sauce (plus more for seasoning later) and bring to a simmer. Continue to simmer for 15-20 minutes. Scoop out spices and discard. Continue with directions: Make the Soup. Sidekick: The choice beverage selection with this slightly sweet, somewhat spicy dish is a Vietnamese beer (which can be hard to find†), so try looking for other more commonly found Asian beers such as Sapporo. For wine drinkers, a chilled glass of Gewürztraminer or Riesling would also pair well. † Your best bet for finding a Vietnamese beer is at a local Asian Market or World Market.